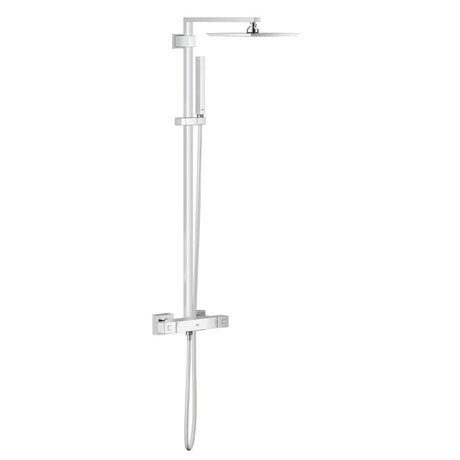 The Euphoria Cube XXL System 230 Thermostatic Shower System is the perfect choice for the modern bathroom. It boasts a 230mm head shower that can swivel to create the perfect angle while the single function shower handset offers flexible showering, both of which feature SpeedClean silicone nozzles so any limescale can be wiped off easily. The thermostat's GROHE TurboStat® technology means you can take a luxurious shower secure in the knowledge the water will stay at the pre-selected temperature even if the water pressure changes. The stunning shower is finished with GROHE StarLight chrome coating, making it easy to clean and retains its shiny and new appearance for longer.